Choose a departure time that suits you between 8am and 7pm, and meet your private guide in central Florence. Then, set off on foot to one of Florence’s privately owned and best-preserved medieval tower-houses. On route, hear the history of these fortified residences, learning how they were built between the 11th and15th centuries for defensive purposes by Florence’s feuding noble families. 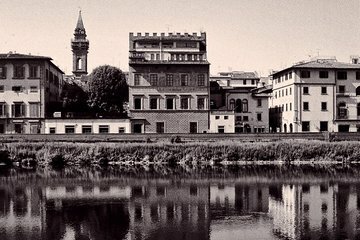 Constructed beside the families’ opulent palaces as fortified refuges during periods of factional fighting, their numbers reached a height in the high Middle Ages, when the rivalry between Florence’s Guelph and Ghibelline factions plunged the city into civil war. On arrival, take in the tower exterior, and meet the owner, a renowned antiques dealer. Then, accompanied by the owner and your guide, head inside to explore. Learn how, when, and why the tower was constructed and by whom, and as you climb up through the floors, admire the architectural highlights and rooftop views from the windows. Enjoy the opportunity to chat with the owner — a true Florentine — and build a fascinating picture of what life was like in the warring medieval city. Following your visit, your tour concludes in central Florence when your guide departs.